The School requires all candidates for a degree to successfully complete appropriate graduation projects, i.e., thesis or dissertation. Credit is earned by completing study or research assignments and submitting an essay, critical analysis, hypothesis, or by completing an examination in the required course. Graduation Projects, once submitted and accepted, become the property of the Saint Mark Seminary & College. Graduate Projects must be suitable in length for acceptance and under the guidance of a faculty member assigned to the student. The cover of graduation projects must contain the words: "Submitted to St Mark Seminary & College in Fulfillment of the Requirements for the Degree of ____." Graduation Projects (thesis or dissertation) must be appropriately bound or placed into an appropriate three-ring binder. Upon graduation you will be directed to the appropriate agency responsible for certifying or licensing members in your particular vocation. Remember that a degree is not a license to practice any vocation. CARE is available to students with skills developed during employment or non-traditional educational experiences, as well as training achieved through seminars, practica completed and cocurricular experiences related to their degree program. Applicants may request an evaluation of their academic portfolio listing courses, seminars, lectures, texts read, independent research, publications, and cocurricular and life experiences achieved. Credit is awarded upon a successful review. Students may also challenge specific courses for credit by passing an examination and/or essay requirement and earn advanced credit if the examination and/or essay are successfully passed. Academic credit is awarded to the student for the course challenged. Written petition for such consideration must be made to the College. See Academic Manual for additional information. Cocurricular Credit is awarded under this title as well for Academic or Professional Fellowships; Religious Involvement; Social or Community Involvement; Ministry; Volunteer Work; Clinical Pastoral Experience; Professional Experience; or Parochial Assignments. A maximum of nine (9) cocurricular credits may be awarded per degree program. Experiential Credit may also be awarded for the following: Non-credit College Courses; Religious Service; Military Service; Professional or Work Experience; Published Works; College-Level Armed Forces Institute Courses; Vocational Training; International Travel; Community Service; Professional Seminars; Independent Research; Elective Reading; Teaching (Didactic Experience); Hospital or Prison chaplaincies or internships. See Academic Manual for additional information. It is the sole responsibility of the student or alumnus to notify the College, and Central Archives, of any change in one's name, address, or personal data. CPE Internships or Practica will be arranged for students requiring or requesting this. There are many options open to students in this matter which include hospital or prison chaplaincies, counseling center internships, academic related assistance, nursing home visitation, parochial assignment, or other suitable ministries of service. Diplomas are sent to graduates via the United States Postal Service upon successful completion of all academic and financial obligations. Those wishing their diploma sent by priority mail must request this in writing and include a $25.00 fee for this consideration. Those wishing to receive their diploma in ceremony may do so annually on the first Sunday of August. This must be made known to SMSC at least three (3) months prior to the intended issuance of one's degree. These ceremonies are open to all alumni and they are encouraged to attend and meet the graduates and other alumni. There is a Commencement Exercise Fee of $200.00 for the gown rental, ceremony, and social after the ceremonies. One (1) CEU is awarded for every ten (10) hours of Instruction at a recognized in-service program or an approved study. Normally, one (1) CEU equals ten (10) contact hours in a learning experience. A CEU is not academic credit but verifies that one has accomplished significant goals in continuing education enhancing their professional expertise. CEU are required by most professional organizations annually. Each major core must be completed independently of one another. A petition for a double major should demonstrate how the requirements for both cores would be met. Completion of two majors does not result in the awarding of two degrees. A student who completes two majors may choose the degree to be conferred, and may request and pay for a licentiate in the second major. Courses that may be required in two different programs are not repeated but apply to both. A specified number of grade points can be earned through the research of various subjects related to the degree being earned. Students should always select electives that will enhance their major or minor. The student selects and finds the texts used. Museum research or library projects may be described in essay or audio and submitted for credit. There is no text fee for ISE courses but an ISE Fee is paid. SMSC does not award credit but uses grade points (weight) that must be earned in order to qualify for graduation from a study or degree process. An "A" is worth four (4) points and an "F" is worth no (0) points. A specific number of grade points are required to graduate and the program into which one matriculates determines these. The grade point awarded shows the actual weight (or work value) in a study and of the individual. The Grade Point Average (G.P.A.) of students is determined by the number of points earned. Students failing a course may challenge it to receive a higher grade one time. Grade points and will be calculated according to the second grade. Unofficial Withdrawal may be imposed on any student who, in the opinion of the instructor or the Rector, has not maintained regular contact with the school for an unexcused period exceeding sixty (60) days. In this case, a student is advised that s/he can be excluded from the process without credit and be subject to an alternate course of action and loss of any discounts awarded. Usually an essay must be submitted monthly (every 30-45 days) unless otherwise agreed to in writing. Any disciplinary action against a student that one feels is unwarranted may be brought before the Academic Ombudsman. There are systematic procedures for making an appeal that will be furnished upon request. These must be made within thirty (30) days of the action taken against a student. The decision is considered binding arbitration and all fees related must be paid in full. Degree completion varies on the amount of credits required in a particular discipline. It is usually accepted that one should complete studies for a specific degree within a twenty-four month period unless otherwise agreed upon in writing when commencing a study program. Extensions can be requested in writing from the College along with the $50 Study Extension Fee that covers 30 days. Graduation Projects must be completed within one (1) year after a student applies for candidacy unless otherwise agreed to in writing at the commencement of the project. Psi Epsilon Delta is open to men and women enrolled in any of the academic programs. Membership is awarded in the name and professional discipline of the applicant. Information pamphlet and application can be obtained by writing the College. The Review Committee receives petitions for Honorary Degrees. Some consider an honorary degree to be in theory an earned degree because recipients have been awarded the honor based on professional successes, academic and community achievements, benevolent contributions, life experiences, and research conclusions. The words "Honoris Causa" are placed on the degree to distinguish it from an academically earned degree. Petitions must include why the applicant is deserving; two (2) current photographs; a biographical history including newspaper articles and/or published works; awards, achievements, citations, commendations and professional accomplishments. Petitions are reviewed each quarter and nominees rejected may apply once more within the year. No honorary degree is awarded for birthdays, retirements, anniversaries, and so on. These honorary degrees include Doctor of Divinity, Doctor of Sacred Laws, Doctor of Humanitarian Services or Social Service Ministry; Doctor of Theology; Doctor of Sacred Philosophy; and Doctor of Canon Laws. "The Family Educational Rights and Privacy Act of 1974" prohibits the release of any transcript or student information recorded therein to a third party without the students written consent or signed transcript release form. Transcript copies are obtained from Academic Archives, Attn: Reverend Steven Johnson, 1719 South 7th Avenue, St Cloud MN 56301. You must include $10.00 per copy required, non members of the Alumni Association must include $15.00 per copy desired. Payable to "Syriac-Greek Synod." The Ad Eundem Provision allows us the right to review applicants who have completed at least 2/3 of degree requirements at another recognized institution to become a degree candidate. A Graduation Project is obligatory. Seven studies must be completed in the academic core either through research and/or text completion and/or hypothesis, essay, oral defense, or other approved method. Tuition is charged for all experiential credit awarded. Additional information may be obtained from the College Administration. Credit Transferred. Not all courses can be transferred to all schools. Accreditation does not mean automatic acceptance of credit by any school, or their recognition of each other or the accrediting agencies involved. Courses will transfer if: (1) They fit into a particular curriculum; (2) Are comparable or equivalent to courses offered; (3) Are "C" average or above; and (4) Must have been earned at a recognized institution or learning experience within the last seven (7) years. Terminal courses usually do not transfer. Credit transferred will be charged for since it will appear on our transcript towards your degree. Tuition is not accessed but $30 per transferred credit is charged. Exemptions: Students who have completed academic requirements for one graduate degree may be granted exemption in part from requirements in another graduate degree program with similar requirements. Certificate Programs offer no exemptions. Projects Completed Elsewhere: A work accepted at another institution, as partial or complete fulfillment of credit requirements for a degree, is unacceptable. Works must be original and become the property of SMSC. Copyrighted projects are unacceptable unless the wording contains the name of the author and "St Mark Seminary & College". However, parts of work submitted to other schools may be used as a basis for further development at this institution provided this is disclosed at the beginning of the work. 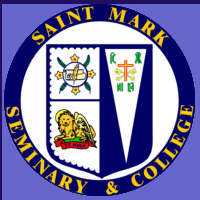 No student, organization, member of faculty, employee, or other institution may use the name of the St Mark Seminary & College for any purpose, excluding biographies, bio-data, and resumes, without the written consent of this College. You can help us for many years to come by opening a named endowed scholarship fund to memorialize yourself or family member. Your bequest or gift can take the form of Cash, Property, Stocks, Annuities and Bonds, Transfer of Assets, Life Insurance, Trust Funds, or Bequests. Guidance will be given in this matter to all who request it. Donations are always accepted and are tax-deductible. SMSC reserves the right to modify or cancel courses for just cause and transfer students to another similar course. It accepts no responsibility for failure or inability to provide services of any kind associated with its faculty or circumstances beyond its control which include, but are not limited to: policy changes; strikes; postal delays or errors; changes in the curricula, et cetera. Applications and Discount Agreements and Scholarships become void after thirty (30) days without notice if not acted upon by the applicant or student, or should the student default on the financial agreement. SMSC may discipline its faculty when appropriate and after administration, a student, or other faculty member has brought credible charges against them. It also reserves the right to modify its admission and/or graduation requirements; to amend or modify curricula or instructional materials; change tuition and fees; amend regulations affecting the student body; refuse admission or reinstatement or dismiss a student for just cause; and to relocate to another facility. It is the responsibility of the student to inquire about current norms. Students accept tuition responsibility once they are officially accepted and a tuition agreement, or down payment, is made. A student who has a bad payment history may forfeit the scholarship and/or tuition assistance and is then responsible for the full tuition. Students who pay for the entire degree program (Program for Degree Term) are not subject to tuition increases. All agreements are binding.